I *need* to see this! 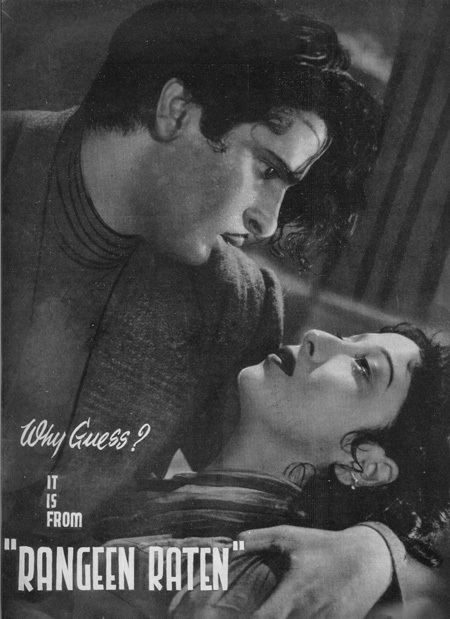 There are so many Shammi films out there still not available on DVD (or even VCD!) that it verges on CRIMINAL. Get to it DVD-making people! What are you waiting for?! 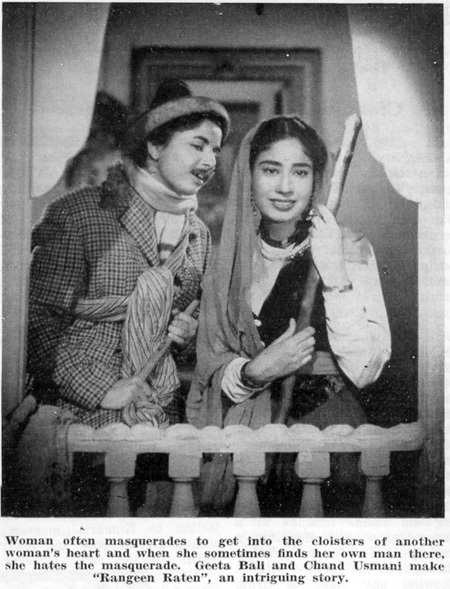 It’s Shammi—and Geeta Bali in drag! Posted on June 17, 2009 at 11:07 am in Hindi movies, Vintage Bollywood images, Yahoo! Shammi! | RSS feed You can skip to the end and leave a reply. It is amazing that there are so many Shammi films not yet on DVD. You need to do a letter writing campaign to all the major Indian DVD companies. 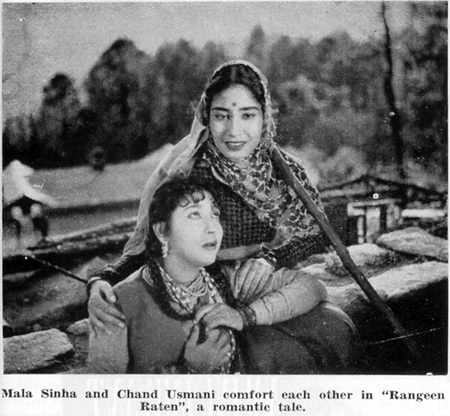 In the picture above Mala Sinha seems to be dying. Shammi Kapoor looks shocked. So I’m sure Geeta Bali gets him (as in real life). Doesn’t Shammi look bhaiya Raj in this photo? I thought it was he, and wondered if memsaab had suddenly changed her Raj K’pinion. Never!!!!! Never in a million years shall anyone, even his own brothers, replace Shammi! Chand Usmani seems to be a character who is “blind” – looking at the two screen caps! Don’t even talk about this. It fills my heart with unimaginable pain. To think of all the movies I’m not ever going to be see. You may remove this comment if you wish as it has nothing to do with Bollywood (I am unashamedly taking advantage of the number of people visiting your blog). May I add something about what I am currently involved in? Am translator/subtitler (working for free) and general background researcher etc. Hopefully it should come out soon. At the time of writing, the people subject of the story have been now 14 months out in the “mountain”- they take no financial help from anyone and “earn” their living through “work”: helping people park cars, carry heavy shopping, helping the church in distributing their food bank to the local needy, etc. Previous to that they have spent on average more than a year, many even 2, in the “temporary” govt. centre in the city. So this is the movie, which is written about so much, when they talk about Mala Sinha. Supposedly, Geeta Bali met Mala Sinha on the sets of this film and took a liking for Mala and ‘groomed’ her, whatever that means! I would like Geeta Bali to get the hero! Ooh Roshan wrote the music? Even more reason why I *NEED* to see it!!! Come on KMI! Shemaroo!? Somebody?? Yes, many movies are probably not on VCD or DVD. I might(not sure) have seen it onVHS. Char Dil Char Rahen has a minor role for Shammi Kapoor and Kumkum and there is a song-dear johnny darling stella. It’s one of those ‘odd’ movies-could be K A Abbas movie. And when they DO bring them to DVD, they just cut some scenes totally -Jab Pyar Kisise Hota Hai(Dev Anand and Asha Parekh). Other movies that I have on DVD have also got a few bits-not whole scenes- chopped off. And youtube just suspends accounts. So many people take the trouble to upload old songs-very rare songs. BIG COMPANIES??!! Pray where can we find the dvd’s then huh? Even in India they are not available. And here in Australia? NO HOPE! Angry and frustrated old movies fan, that’s what I am. Maybe we can unite and form a club! Or even better, our own DVD manufacturing company!!! There is a bit of a light from companies like KMI in Amsterdam and Shemaroo (although I wish they’d start checking their masters before making a gazillion copies to sell). As someone suggested above, we need to keep pestering them for the things we want to see! Didnt Baburao comment on the title of the movie? Rangeen Raaten – colorful nights – with not one, not two, but three ladies gives material for a lot of colorful speculation on the plot, and I am surprised Baburao ignored such an obvious target! I am all for setting up a DVD manufacturing company. But if all of us (oldies Bollywood fans) started manufacturing DVDs, then the market will already be gone! Re: editing, I dont think the problem is always with the source material. Different manufacturers tend to use the scissors with various degrees of generosity, too! I just want to thank whoever dreamed up that top publicity photo. Why guess! Hope this tides y’all over until we get a DVD release … a glimpse! Thank you! Thank you!, Muz! If that’s an example of the music in this film then it really deserves to be on DVd for all of us to enjoy it. Man, oh man…a poster like that..me want to see it really bad too! !